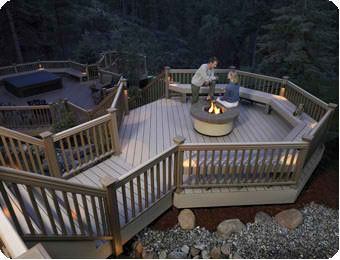 Augment the beauty of your Portland patio or deck with a waterproof, safe and practical railing system by TimberTech®. Keith Green Construction recognizes the quality in production and longevity of TimberTech’s composite railing, proudly offering it to our Portland clients. Eliminate the yearly chore of maintaining traditional wood railing systems. Made from high-quality raw materials, combined with a protective, UV-inhibiting coating. Color is maintained despite the harshest weathering. Coating pigment reflects excess heat, helping the railing system resist fading and warping. Safety first: TimberTech® Railing Systems resist splinting and slipping: perfect for children and the elderly. Find the perfect rail to match your deck: Ornamental Rail, RadianceRail, Curved Rail, BuilderBoard, and BuilderRail systems available. Backed by a Limited 25-year Warranty.